You’re a blogger, which means you understand the importance of interaction. You recognize that the success of your blog, to a large extent, depends upon how effectively you communicate with your audience – and how easily they are able to communicate with you. But what if I were to tell you that you are inadvertently putting up barriers to simple interaction? What if I were to say that one simple omission can leave your visitors frustrated and disinterested? That is not the end result you are looking for – and today, I want to reveal what you can do to fix the problem. People who are new to the blogging scene dream of automation and passive income. But the reality is entirely different – whilst blogging can be enormously beneficial both on a personal and business level, it is certainly not passive and shouldn’t be automated. It often takes a considerable amount of time for those false dreams to fade, and even when people accept that blogging requires hard work like anything else, they can find it hard to let go of old habits. But I digress. The point is this – we are often looking for the easy solution. But the easy solution almost always comes at a cost. And that brings me to the topic of this post today. When it comes to people contacting us, we want it to be organized and efficient. The problem is that organized and efficient in our eyes can come across as cold and artificial in the user’s eyes. And ultimately, how they feel about the experience is far more important. Sorry Graywolf – you’re being named and shamed. As a reader, I couldn’t imagine anything less inviting. Let’s say I’ve been reading through the blog and I like what I see. 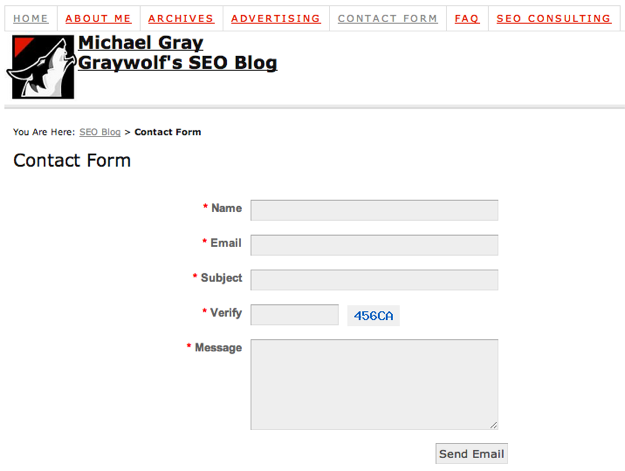 I want to reach out to the blogger, so I click on the rather uninvitingly-titled “Contact Form” page. Lo and behold, I am presented with precisely what I was promised – a contact form. And that in itself is the problem – many people do not like using contact forms. From a usability point of view, you are taking control away (a big no no). There are multiple reasons why people will want to use their own email client (they’re used to it, it means their message will be saved to their sent items folder, they may be using a mobile device which makes the contact form difficult to fill in, and so on). It’s this simple – if you only put a form on your site, you are driving potential evangelists away (I spoke about evangelists in last week’s post on building an email list). The people who hit your contact page are often the ones most likely to generate income, either directly or indirectly. They are the ones reaching out to you – the ones who are engaged enough to spend time contacting you. So you should facilitate that process in as inviting a way as possible. Alexis Grant’s contact page is warm and inviting. She doesn’t put up barriers – on the contrary, she makes it clear that she actually wants to interact with her readers. And most importantly, she gives them multiple ways in which to do so. 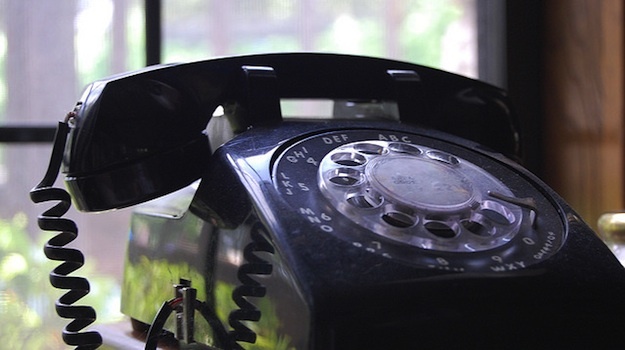 Creating a good contact page is not complicated in the slightest. Just tear the barriers down, reach out to your readers with a personal message, and allow them to contact you in as many ways as you feel comfortable. Choice will not be overwhelming in this instance – people will simply go to the option that they favor the most. From there, the sky is the limit. Add as many methods of contact as you feel comfortable with. The more the better. For instance, a telephone number serves to heighten the perception amongst your readers that you are in fact a “real” person. If you’re not comfortable handing out your personal number, just pick up a spare SIM card. Don’t be afraid to think creatively. What’s on your contact page right now? Are you happy that it represents a free-flowing passage of communication between you and your readers, or do you think it’s about time that it got an overhaul? Let us know in the comments section! I always look forward to read your insights they are always a good read – Thx. Thx for the tip – and thank God for those people and scripts that can hide our emails for the crawlers … Hmmm wish the world was more like God then we would not need to hide anything. The world do not need spammers, crawlers etc. No problem Peter – my pleasure! I think it needs to be pointed out that Alexis’s form still has all the fields that your sample form above shows except for the Verify field. You are just not showing them in your excerpt. What she has done is to make it look friendlier through her choice of font and format and the introduction. On the other hand when one clicks a button on the menu bar that says Contact or Contact Form the intention is probably there to make contact and doesn’t really require the further friendly inducement. Personally I’m not so keen on posting my email address and that is not just because of the spammers. If I need or want to change my address then I need to communicate that to everyone who might have saved it to an address book. By using a form any address changes remain hidden because the user doesn’t need to know it. Sorry, Tom, I have to vote for Clark. Because I was curious to discover if you had a real point to make, I scrolled past the rambling introduction. When I finally got there, it was worthwhile, especially the example from Alexis’ site because I really hadn’t given much thought to how uninviting the typical Contact Us page might be to “normal” people. Now I know and will fix mine. If you were worried about minor annoyances upsetting your visitors, you’d never write such a teaser headline and weird intro to match, stringing it out for dozens of sentences before making a point. I’d imagine you’d lose them before the contact form. And my apologies if that came off as rude, I just thought it was worth mentioning how much those two practices don’t match. 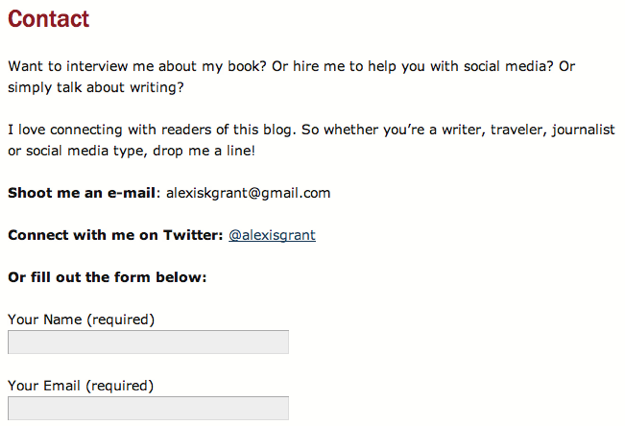 And in my humble opinion, you absolutely must include a contact form on your site, and you must do it in a way that doesn’t hinder the potential for full interactivity between the reader and blogger (which is why I began the article talking about that). So in conclusion, I believe that both the headline and introduction were relevant.